There are so many significant and interesting themes throughout this book, I hardly know where to begin. This story encompasses Los Alamos from the 40’s to the 70’s Oppenheimer and the atomic bomb, Women’s Lib, Vietnam, and perhaps one of the most surprising and delightful aspects—orthonology. Yet, the narrator tells us, as early as page two, that this is not Oppenheimer’s story nor the story of the creation of the bomb; it is not her physicist husband’s story. This, she says, is my story, the story of a woman who accompanied the bomb’s birth and tried to fly in its aftermath. Meredith Wallace is seventeen years old in the fall of 1941 when she begins her ornithology studies at the University of Chicago. As a student she becomes captivated by an older and brilliant professor, Alden Whetstone. 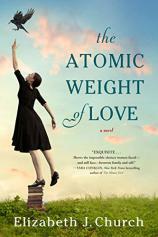 When he goes to Los Alamos to work on a secret wartime project, she follows. She has every intention to return to her own graduate studies but when she becomes adrift in a traditional marriage with severe limitations, she loses her own sense of passion and purpose. She eventually channels her scientific ambition into the study of a family of crows, birds whose free life and companionship are the very things beyond her reach. But when she meets a young geologist, a Vietnam vet, she is awakened to changes she never thought possible. One reviewer says, “A beautiful and sad book that explores the kinds of difficult choices women make for their families.” In the tradition of THE PARIS WIFE and LOVING FRANK, Church’s absorbing novel shows the loneliness and pain that exists for the woman behind the famous man. Perhaps one of the reasons the writing rings so true is that the author, Ms. Church, grew up in Los Alamos in the 50’s, to a scientist father and a biologist mother. Although Meredith’s story is not the author’s story, nor her mother’s, the question that prompted her to tell this story was ,”What could these intelligent women have been and done had they been given the opportunity? I wanted to highlight the sacrifices these women made in the 50’s and how they came to redefine themselves during the tumultuous 60’s and 70’s.” The notes from the author at the end of the book are as interesting as the novel itself. I must admit I never knew crows could be so interesting. One example, crows can recognize individual faces and pass that knowledge on to their young! It is an interesting parallel that as Meredith’s crow journals, where she keeps meticulous notes of their behaviors, change so does she. And a little bonus: each chapter has a few facts about different species of birds—owls, sparrows, jays, and many more. Not only their characteristics but the interesting names for their groupings, such as “ a party of jays, tidings of magpies, exaltation of larks.” Perhaps good to know should you be a Jeopardy contestant someday. Church, a lawyer by profession, turned writer late in life (this is her debut novel, at age sixty) has created a story about the moral choices we make and their cost and consequences. It is also a slice of life of a pivotal time in our country’s history at a unique site in America. I highly recommend it, perhaps best read on a porch swing or hammock while watching a“charm of hummingbirds”. 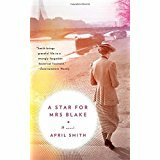 A Star for Mrs. Blake is the fictional account of five mothers who lost their sons in World War I. It is, however, based on historical events and two actual people in history. Although the Americans fought for little more than a year in World War I, there were 116,516 soldiers killed and more than 30,000 Americans were buried in the U.S. cemeteries in Europe. In 1929, Congress passed legislation to fund travel for widows and mothers of fallen soldiers to visit their loved ones’ graves in France. During a three-year period, 6,693 women made the trip. Cora was designated to be the leader of her group of American mothers, in “Party A”, consisting of Katie, an Irish maid, Minnie, the wife of an immigrant Jewish chicken farmer, Bobbie, a wealthy socialite, and Wilhelmina, a former tennis star whose mental health is precarious, and Mrs. Selma Russell, the only black lady among three busloads of pilgrims, as the Gold Star mothers were called on their journey overseas. In spite of the somber task they were undertaking, the author injects a lot of humor as they begin their adventure. They are treated royally both in Boston and New York City before their departure. There is, however, much confusion as one of the mothers in Party A gets lost in New York and there is a mix-up of the two Mrs. Russells. ( one from Party B). They are rushed from one dizzying site to another—the Empire State Building, Broadway, Central Park Zoo, Fifth Avenue, Grant’s Tomb, accompanied by their liaison Lieutenant Hammond, a handsome twenty-three year- old recent West Point graduate and Nurse Lily. As they are crossing the ocean in their first-class accommodations, we get a good glimpse into each of their personalities and how they interact, which lays the groundwork for future events. They finally debark in Paris where they are treated as celebrities. We now meet two American journalists in the story, Clancy Hayes and Griffin Reed, who will play significant roles in Cora’s life and hence the story. They also serve to illuminate issues of ethics, propaganda and the role of the press in determining how war is presented. Griffin, having a severe face disfigurement, wears a mask, created by Florence Dean Powell, a character based on the real-life Anna Coleman Ladd. Ladd was a socialite and sculptor living in Boston in 1917 when she read about the work of another sculptor who ran what was called the “Tin Noses Shop”. This was a mask-making studio for disfigured British soldiers. Inspired, Ladd set up her own studio in Paris and set to work sculpting new faces for those who had lost a piece of their own in trench warfare. Her studio also created a safe haven for the men who couldn’t be seen on the street in their hideous condition. As you can see, there is much historical data intertwined in this story which goes on to tell of the mothers finally achieving their goal of seeing their son’s graves. There is a lot of drama associated with this event and a few surprises along the way. This story is also very much about friendships and relationships—among the mothers, between liaison Hammond and nurse Lily, between Cora and journalist Reed and for Cora and one other mother, the men they are involved with in America who want to marry them. 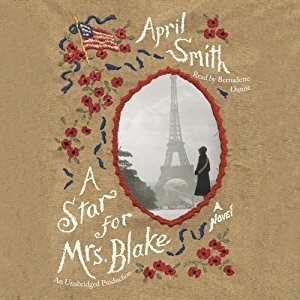 In the author’s postscript, April Smith says the story was inspired by the diary of the real Colonel Thomas Hammond, also a West Point grad, who accompanied actual mothers to Paris, as does the Hammond character in the book. She is grateful to the Hammond family for access to the story of the father and grandfather who are now both buried with honors at Arlington National Cemetery. Author Smith makes it a point to travel to every location she writes about in her books. She takes pictures and talks to people and just wanders. Back home, she outlines her story on a white board and begins writing. The process can take from two to twenty-five years, as was the case in a Star For Mrs. Blake. Her vivid and detailed descriptions are proof of her first-hand knowledge. This is an excellent book for a book discussion group. Many facets to discuss, but aside from that I agree with author Nelson DeMille, (Word of Honor) who says, “Everyone who has served or is serving in the military and their friends and families should read this book.” I would add to that…every American… to gain a greater appreciation of our history and the sacrifices made for the precious freedoms we enjoy today.